Valerie has held various leadership positions in international corporations across a broad range of industries. She was a Vice President of Human Resources in a global manufacturing organization and for a national retail company. She has more than 22 years of experience in leadership development and executive coaching, and she has been working as a master facilitator and executive coach since 2014. She combines her understanding of business and leading people with neuroscience and strength coaching methodologies. She facilitates on the topics of Change Management, Influencing Skills, Communication, Executive Presence and Presentation skills. 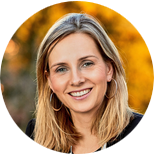 A strong advocate for lifelong learning, Valerie holds a BA from McGill University, an MIA from the University IX Paris Dauphine and an MBA from UQAM, along with ICF-ACC accreditation and certifications in a number of psychometric assessments. She is fully trilingual in French, English and Spanish. Valerie currently lives in the San Francisco Bay area. She is a mother of three and an avid Ironman triathlete. Her family is her life purpose—and she offers the same genuine and generous presence to her clients. Valerie believes in the power of straightforward questions—those are what led her to becoming a successful coach. As an ICF certified coach, she is your trusted confidant on an effective journey of self-discovery with the goal of bringing out the best in you and your team. She shares her thoughtful enthusiasm and helps translate your goals into actionable steps; Valerie moves you to act. The only way to learn is through your experiences. She holds you accountable to leading your life with purpose.